Too many precious photos need to be displayed? 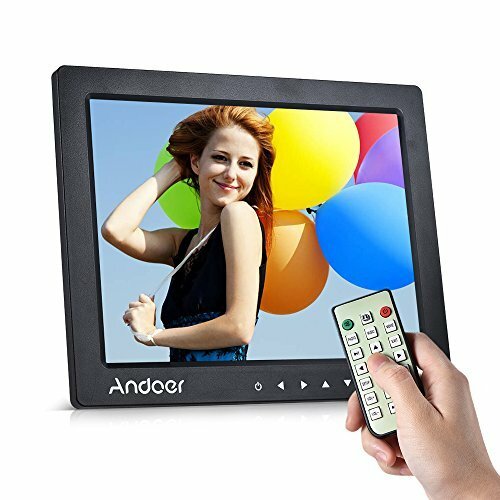 Andoer 10" digital photo frame is here to help! It can display Music/Movie/eBook/Clock/Calendar of various formats. There are basic setting and assistant functions to help you better enjoy the display. You can control it via infrared remote control or by touching the 7 keys on the front. ★MULTI-FUNCTIONAL: It can display Photo/Music/Video/eBook/Clock/Calendar of various formats, like MP4, MOV, AVI/MP3/JPG, JPEG/TXT & etc. Zoom/rotate/special effect/speed/scale(photo), REW/FWD/track/caption/single play/repeat(video) & etc, enjoy yourself !